We don't just think of our clients as subscribers. Our readers become members of our exclusive group of independent investors who we support with a wide range of services. Here is a list of the many benefits that help our members achieve their investment goals and improve the quality of life for themselves and their families. Our flagship email service is the acclaimed newsletter, Global Changes & Opportunities Report, or simply GCOR. This newsletter, that is published ten times a year, monitors the important events that are taking shape in the world, and the ways they are likely to affect our members. 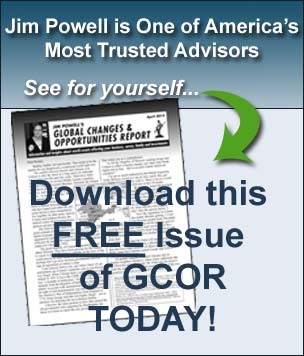 The editor of GCOR is Jim Powell, an accomplished stock analyst with nearly 30 years experience. In every newsletter, Jim always recommends specific ways that readers can profit from world and national events – and avoid any problems they are likely to create. Jim discusses stocks, funds, precious metals, commodities, currencies, fixed income investments and several other assets. In addition to making current recommendations, we also track our previous choices and report news of significance about them in the Portfolio Review section of the newsletter. GCOR is particularly valuable because Jim Powell often identifies developments several weeks, and often months, before they are apparent to others. In addition, Jim is well known for spotting important connections between events that have investment potential – and are rarely reported elsewhere. The pace of change is so fast today, new developments sometimes appear in a matter of hours. If they are likely to have an impact on reader's lives and finances, Jim Powell will send members an email with a summary of the news and his insights about its significance. Subscriber Bulletins always include specific recommendations about how to profit from the events and avoid any pitfalls they may present. Back issues of GCOR are available to subscribers in the Members Only section of this website. Members can read about Jim Powell's past recommendations and his articles about events that are impacting our world. Many subscribers say the archive of past issues is one of the most useful services that we offer. Two main portfolios track the investments that are recommended in our newsletter. The "Core Portfolio" holds the investments that Jim Powell believes should be held for extended periods because they benefit from long-term trends. The "Select Portfolio" includes investments that profit from shorter-term events. In addition, several "Special Purpose Portfolios" are included that contain stocks and funds that profit from specific developments and industry trends that we are following. All our portfolios are updated several times a day. As a public service, Jim Powell makes some of his research available to everyone at no charge. However, our most valuable services are reserved for our readers who have exclusive access to them in the Members Only portion of our website. We think GCOR is the finest newsletter of its type available anywhere, and our readers clearly agree (see our testimonials page). Please look at one of our sample issues and judge for yourself. We think you will find that joining our group is an investment that will pay for itself many times over. Subscribe Today – It will be the one of the smartest decisions that you can make for yourself and your family. We would very much like to have you join our group of independent investors who are determined to be successful during this time of unprecedented challenges and opportunities.